On May 20, Japan's Nuclear Regulation Authority (NRA) completed a draft of a review report concluding that the Ikata-3 Nuclear Power Plant (PWR, 890MWe), owned and operated by the Shikoku Electric Power Co. in Ikata Town, Ehime Prefecture, complies with the new regulatory standards. The NRA will next finalize the report after referring it to the Japan Atomic Energy Commission (JAEC) and the Ministry of Economy, Trade and Industry (METI) for their opinions, as required by law. It will also make the draft report available to the public for one month in order to get comments. Ikata-3 is the fifth reactor for which the NRA has prepared a draft review report, following Sendai-1 and -2, owned and operated by the Kyushu Electric Power Co., and the Takahama-3 and -4, owned and operated by the Kansai Electric Power Co. The basic design of those four has already been authorized, with permission granted to their operators to change reactor installations accordingly. After the draft report is released, the NRA will release it to the public for one month for scientific and technical comments, as mentioned above, after which it will finalize the review report. Ikata-3 is expected to officially clear the examination this summer. After that, consent is required from both the prefecture and local municipalities before the reactor can be restarted, as well as official approval of the construction plans for the detailed designs of facilities and equipment. Any revisions to the operational safety program providing rules for operating the reactor must also be officially approved. At the Ikata-3 site, work on safety measures is currently underway. Given the above timetable, the reactor will probably be restarted by winter this year, at the earliest. 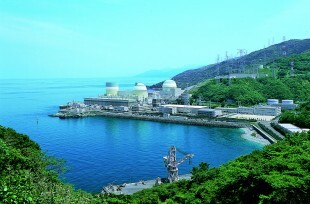 Shikoku Electric Power had submitted its application for confirmation of the reactor’s compatibility on July 8, 2013, the very day that the new regulatory standards originally came into effect. Since then, some 76 meetings have been held as part of the examination. More than a year of that time was spent discussing the effects of a long, large fault known as the “Japan Median Tectonic Line,” which runs about 8km offshore from the Ikata site. The power company raised the estimated ground motion in its calculations to 650gal from the initial 570gal. As a consequence of that change, the seismic resistance of the main anti-earthquake building, where an accident response headquarters would be established, was determined to be insufficient, so a new emergency response site had to be established. Last month, Shikoku Electric Power submitted an amendment to its application for the examination of the reactor, based on several issues pointed out by the NRA during the examination meetings. After the NRA completed its draft review report for Ikata-3, Governor Tokihiro Nakamura of Ehime Prefecture released a comment noting that the examination had proceeded to its final stage, and that the prefecture would confirm the reactor’s safety through its own expert committee.